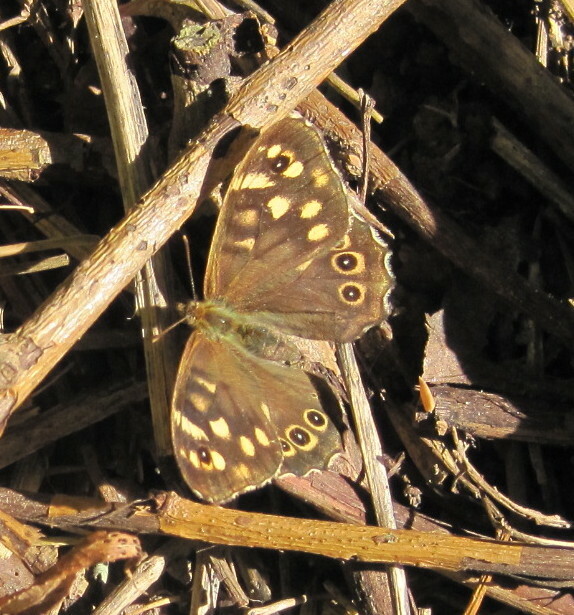 Now the evenings are darker our volunteer sessions are on Sundays at 10.30 a.m.
As well as on appropriate pages on this web site we also have sets of wild-flower, butterfly and tree photos in albums on the Mayfields Community Trust Facebook page. That also should tell you what we are doing on Mayfields North of Nelsons Lane. Many thanks to Stephen Turnbull for his help in setting up the Facebook page. 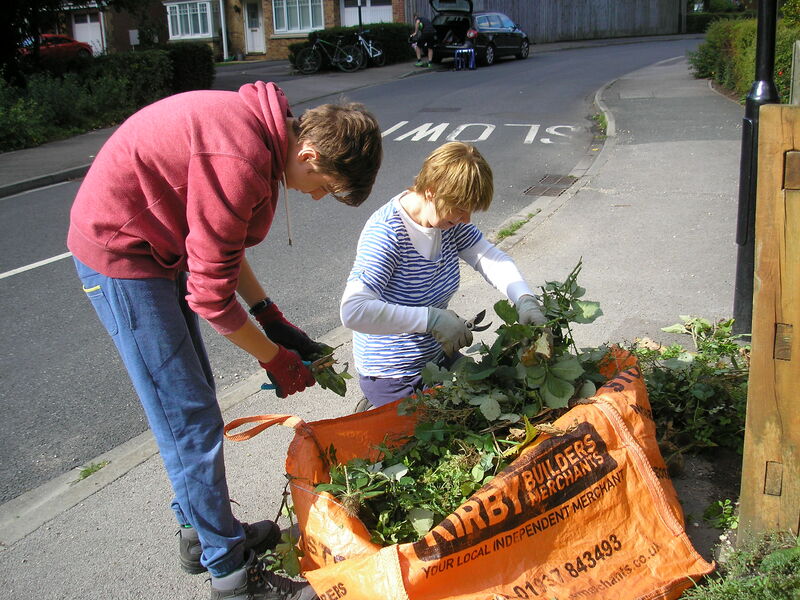 25th of October was a beautiful sunny morning for our 8 MCT volunteers working on the Highways land along Nelsons Lane and the newly grassed path behind homes in Hobmoor Terrace. You can see our efforts on the next 10 metres in a short video clip on the Mayfields Community Trust Facebook page. Alternatively you can just enjoy Pam’s photo of one of the Aspen trees establishing on the site just north of Nelsons lane. 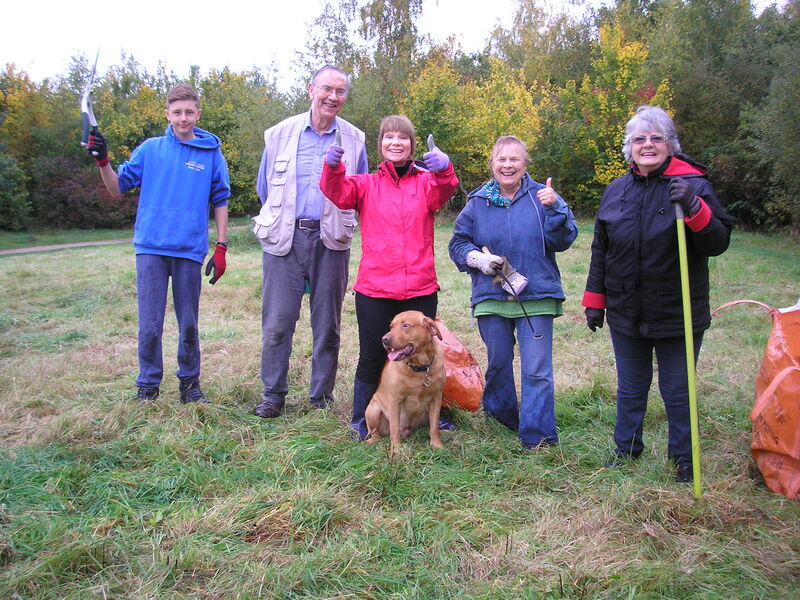 For the first time in more than 2 years of volunteering we got a bit damp on October 18th. 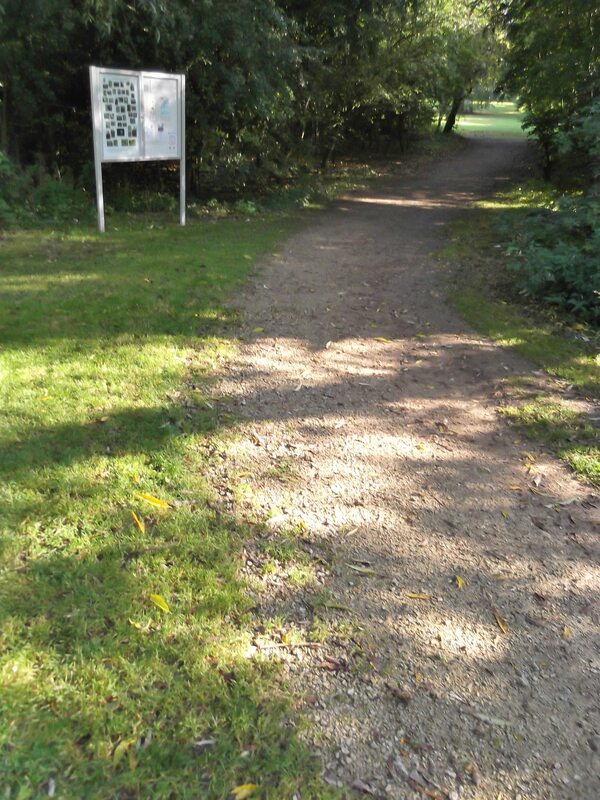 It didn’t deprive us of the pleasure of finishing getting the meadow ready for winter though, as Pam’s photo shows. 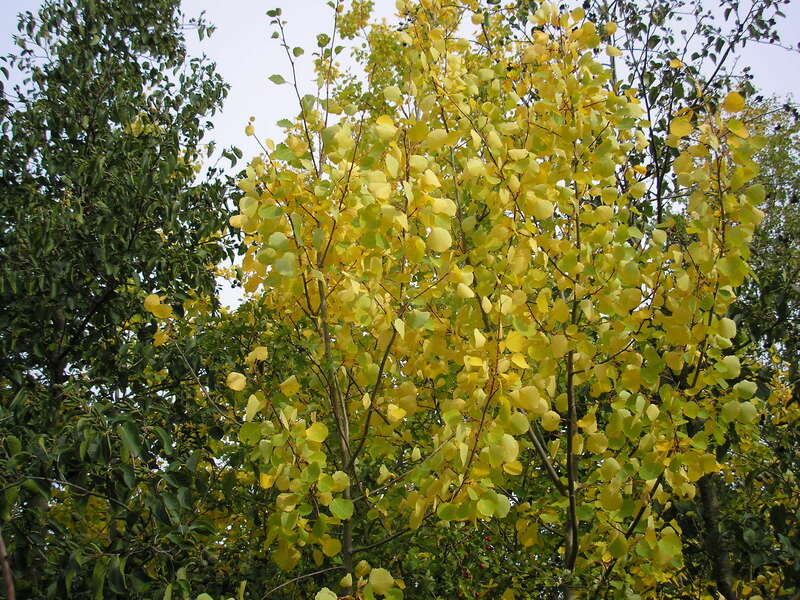 We could then relax and enjoy the beauty of many of the Mayfields’ trees in autumn plumage. 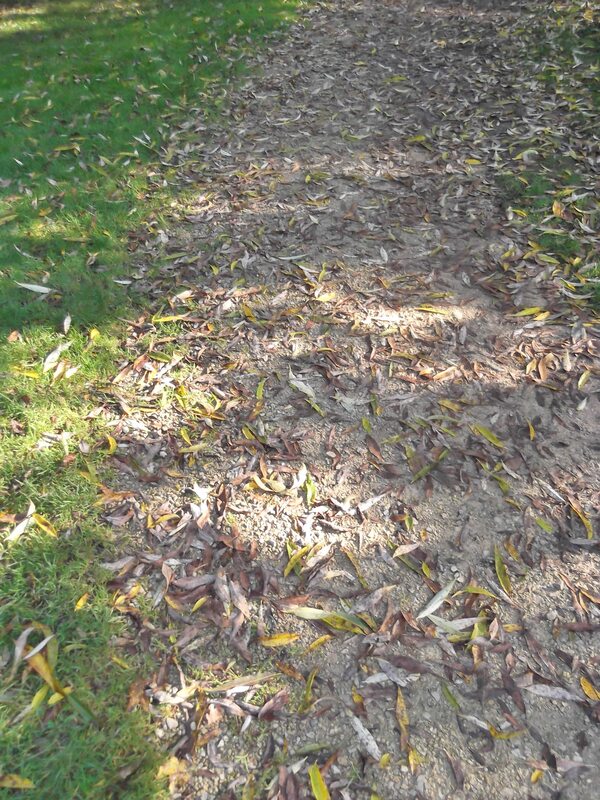 A beautiful sunny Monday morning on October 12 in York – perfect for mowing up the leaves off the path before they get churned in and humified too much. 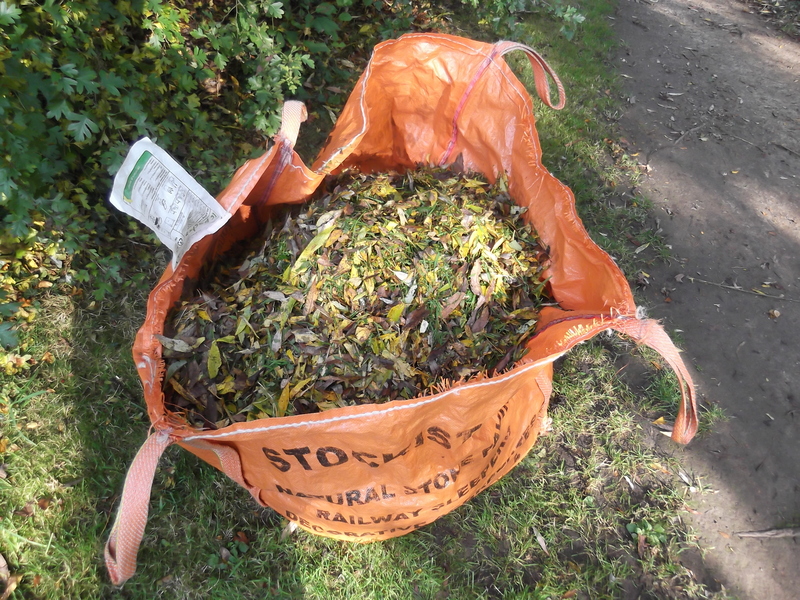 Much better for them to go to the compost heap! 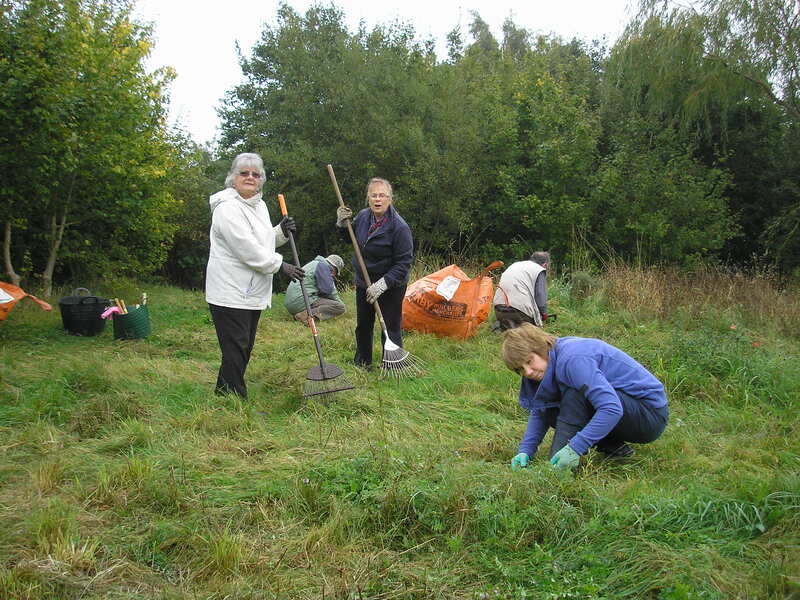 On Sundays on 4th and 11th October 2015, 8 MCT volunteers carried on working on the meadow. Pam’s photos show several of them, with Ben mowing after the others had first cleared long vegetation by hand with grass hooks or sheers. We were pleased to welcome Stephen Turnbull to the volunteer group. The other photo shows why we use a slow pre-cut by hand first. 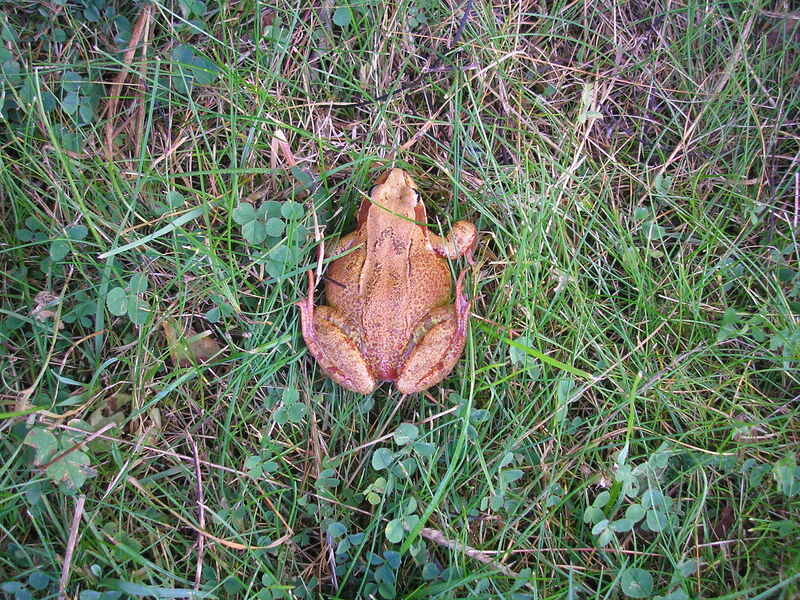 The frog was very grateful as it hopped away happily. Our AGM followed our Public Open Meeting on Monday 28th September, 2015 at the Marriott Hotel. The field work co-ordinator gave a talk about what we have been doing over the past 2 years. The results of the Children’s drawing competition were announced and the pictures can now be seen on the info. board at the Little Hob Moor end. 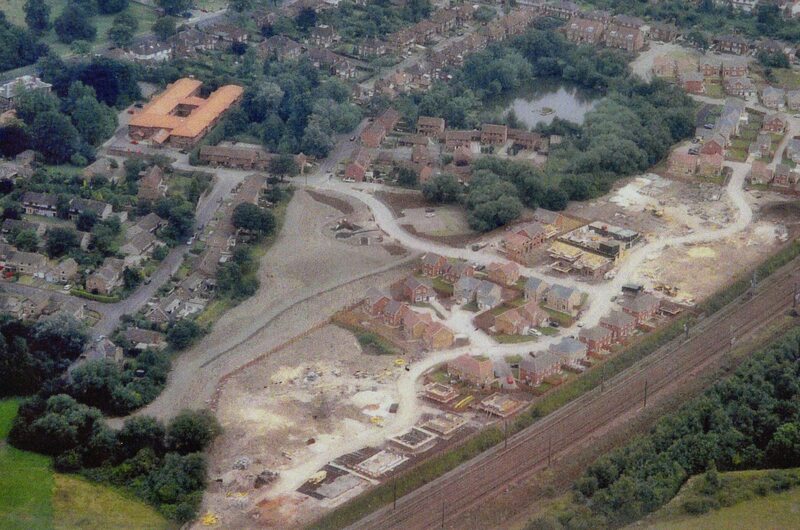 Don Bowerman kindly passed on to us a photograph of the site when it was first being laid out about 18 years ago. It’s nice to see how much it’s changed. 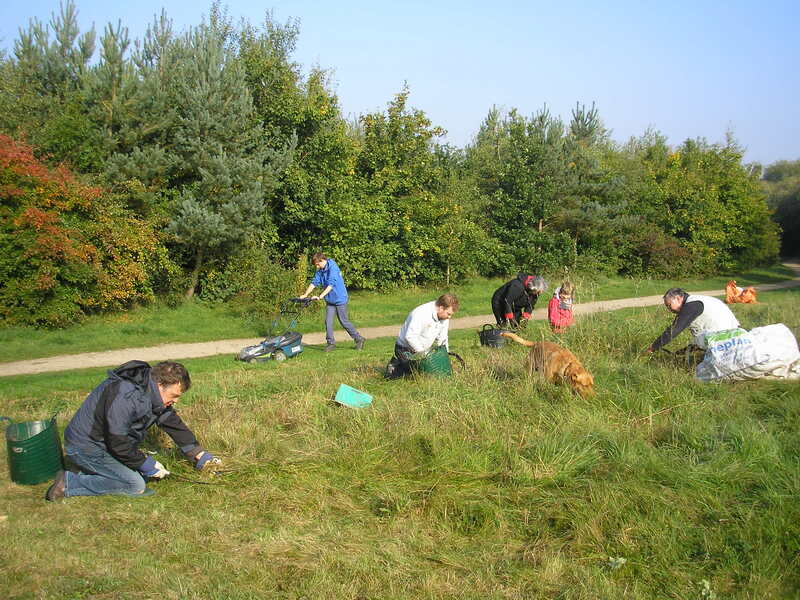 At our volunteer session on Sunday 20th we continued with our work on trimming vegetation on the meadow. 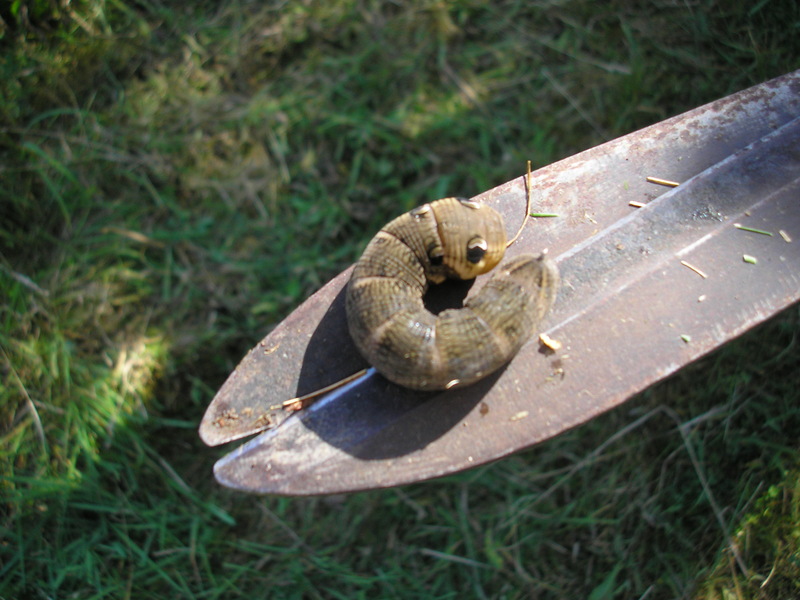 As Pam’s photos show, we’re using grass hooks and sheers rather than strimmers as they allow for more selective removal of species (with less risk to frogs and toads on the meadow!). There was more of the same on September 27th when we were pleased to welcome Mark Tyszka to Mayfields. 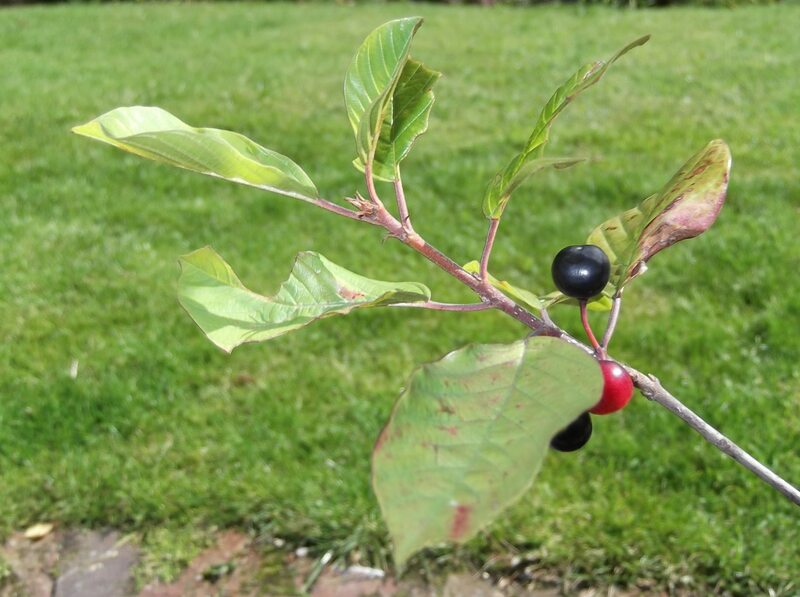 We mentioned a couple of months ago that back in February MCT was given 4 buckthorn tree saplings by Mark Tyszka from Friends of Hob Moor. 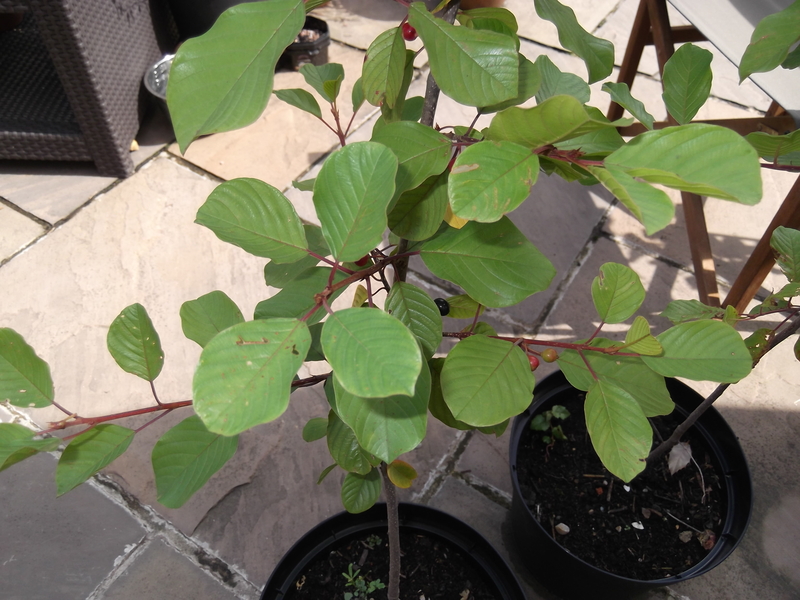 As they are potentially very attractive to Brimstone butterflies we grew them on in 10-litre pots as shown below. 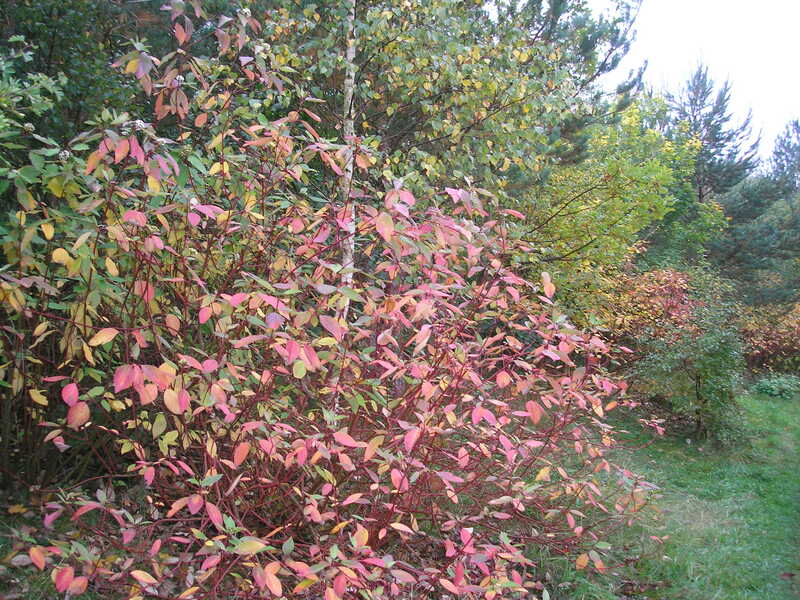 We planted three of them out at the rear of the west bund in a damper area on 16/09/2015 to replace cleared brambles that had got out of control. The soil is a very heavy clay there so it will be interesting to see how well they establish. 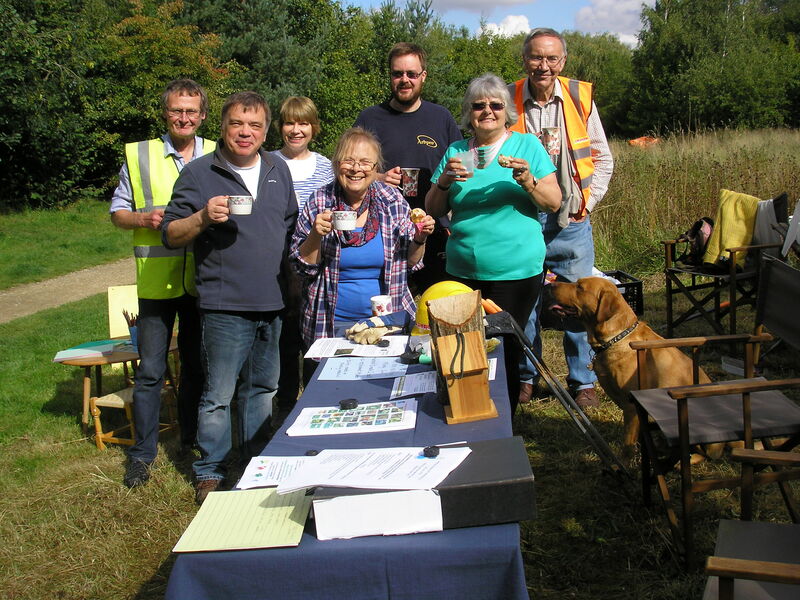 On September 13th a substantial group of MCT Trustees and volunteers manned a table by the gate for recruitment of new Trust members and/or volunteers and to answer any questions site visitors had about MCT’s work. Pam caught several of them on camera in a well-earned refreshment break. 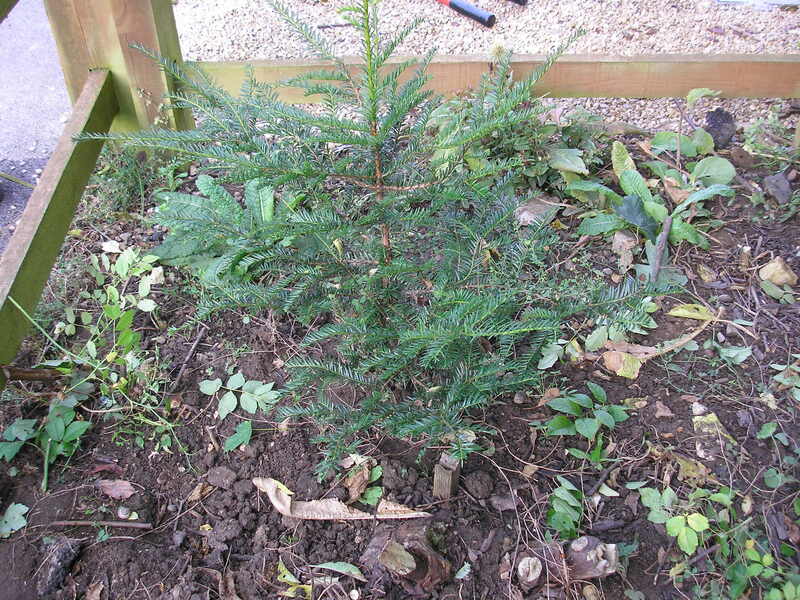 During the day Lesley, Paul and Ben cleared around the Yew tree (that we’ve mentioned before) beside the gate; it’s doing well in response to our TLC! 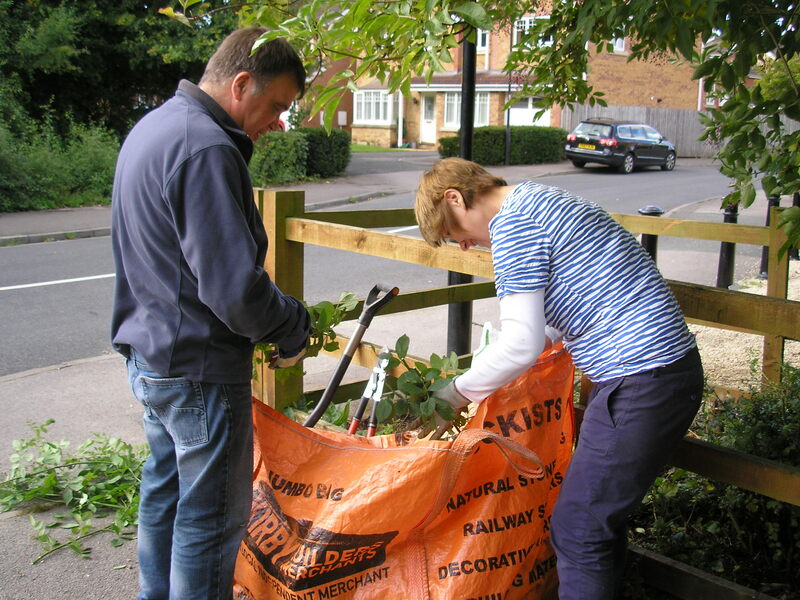 Lesley and Malcolm hand weeded the grass from the path at the gate end – great time to do it after rain as quite a bit of the accumulated soil is removed with the roots of the grass. 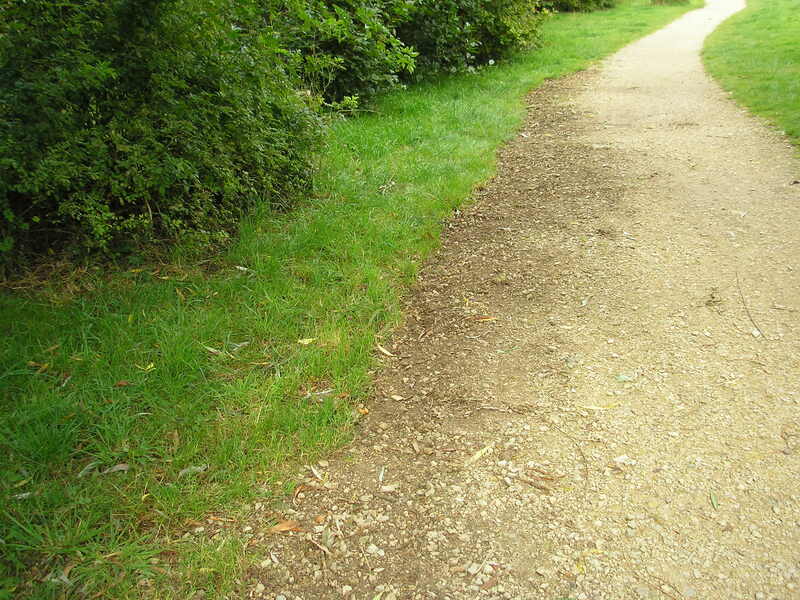 This helps reduce mud accumulation on the path. 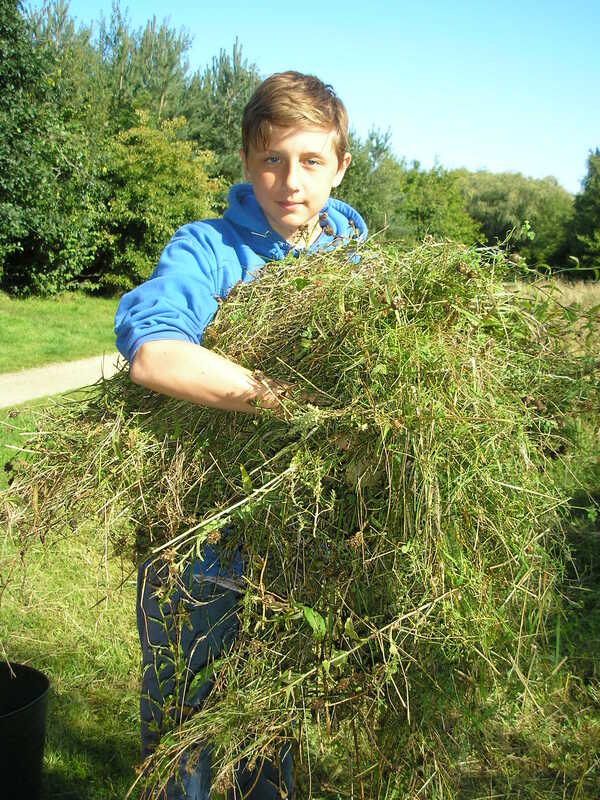 The weeds went off to the compost heap along with all the strimmed vegetation from the north of the meadow which Ben had raked up. 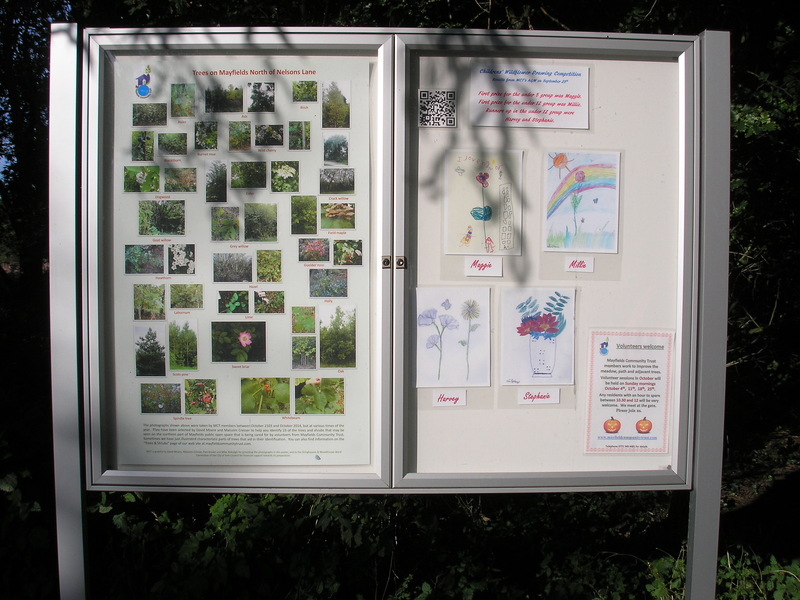 We also planted native wild daffodils around the notice board and at the Nelsons Lane end of the newly established grass behind Hobmoor Terrace. Also that morning Dave Moore and Mike Ridealgh trimmed a crack willow beside the playground that was shading out more desirable tree species and cut the trimmed material up for composting. 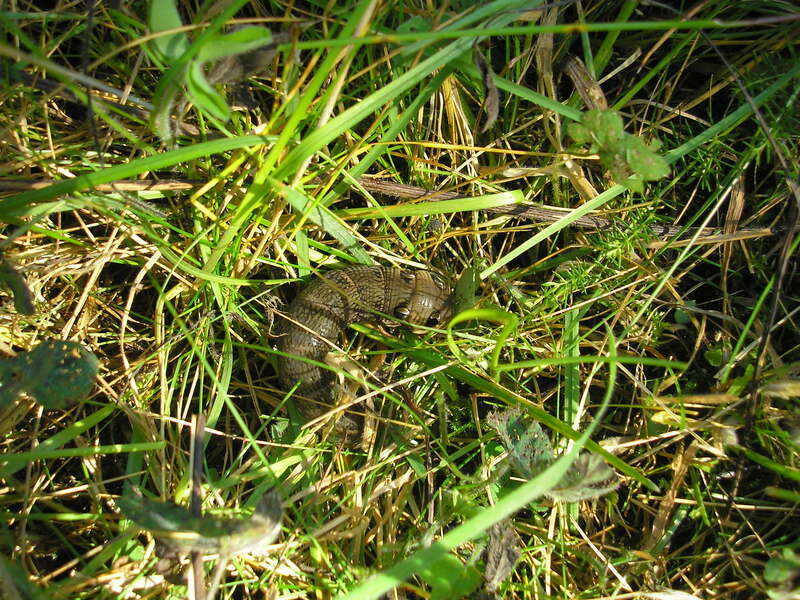 Mike also managed to catch photos of a Speckled Wood butterfly and Looper caterpillar. September is when we start to trim the meadow in easy stages to maintain habitat diversity and areas for dogs to exercise etc. 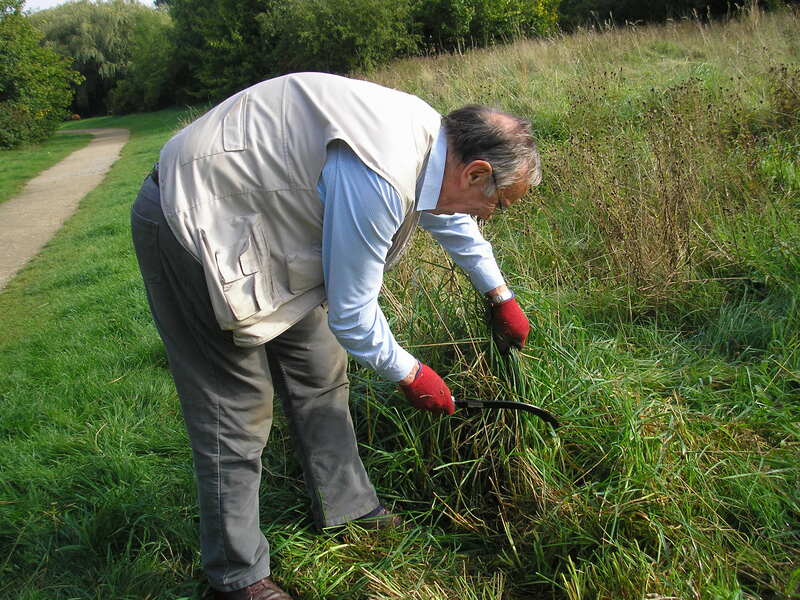 Out volunteers on Sunday 6th took advantage of the warm sunshine in the morning to start on 2 edges. 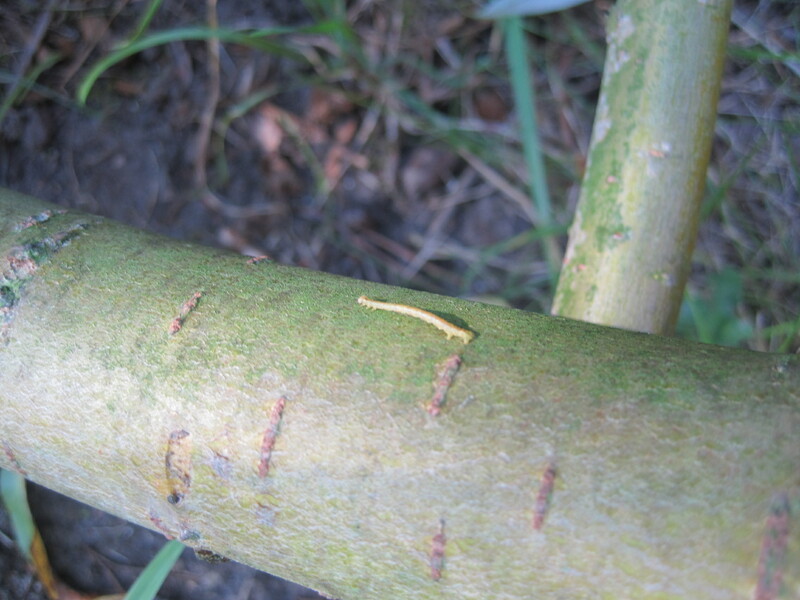 One spotted an interesting caterpillar with protective eye spots and Pam caught it on camera (see below) – probably an Elephant Hawk Moth caterpillar. With warmth and rain the grass has been really growing of late and has taken a lot of trimming to make sure site will look as pleasant and green as possible over winter months and put up with winter usage. 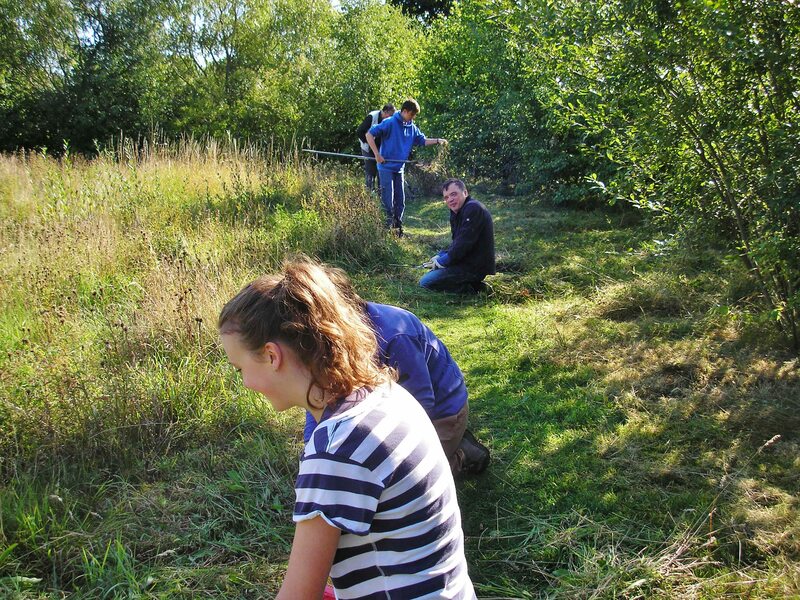 We also trimmed an ever-increasing patch of Willow herb behind a house in Goodwood Grove. Many thanks to the local resident for the generous donation to MCT funds. 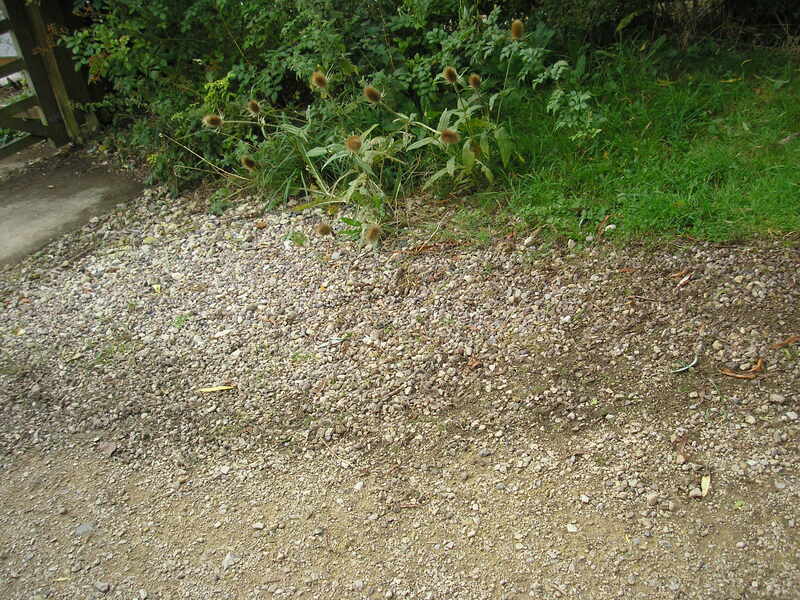 We also “hand-weeded” the clump to the left of the main path to prevent excessive colonization. 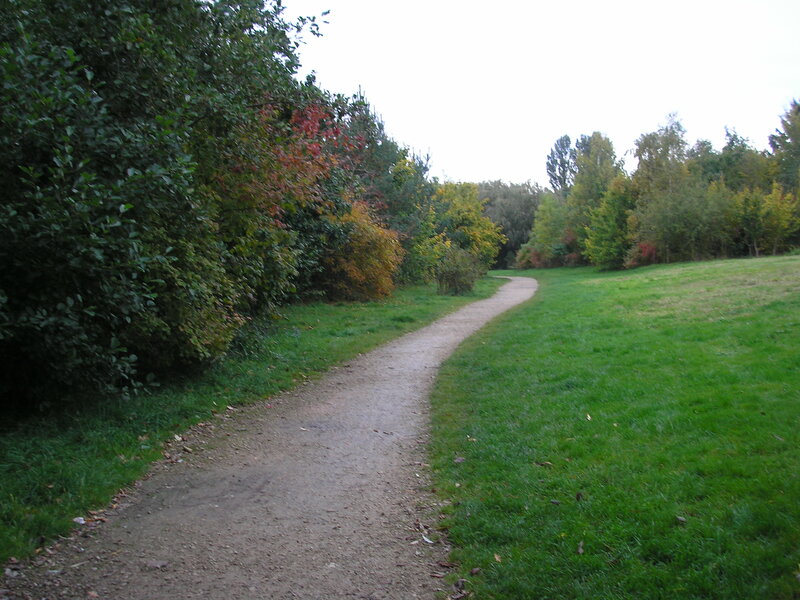 The shade beside the path at the Little Hob Moor end limits to some extent what we can do to improve biodiversity there. 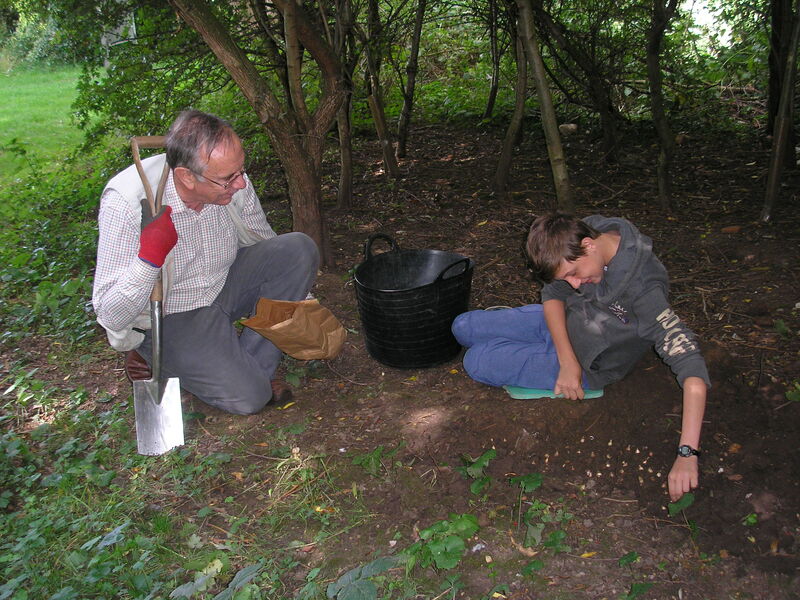 To welcome September, Ben, Malcolm, Louise and Pam planted 500 native Snowdrop bulbs (from TCV) in several groups; this should enhance that part of the site early next year.